If It's Too Loud...: BODEGA - "How Did This Happen!?" When a band is described as an "art rock unit," you know the art is going to be more important than the music. That's not the case with Brooklyn's BODEGA. Their new single, "How Did This Happen!?" is far too rocking and catchy to just be art rock. 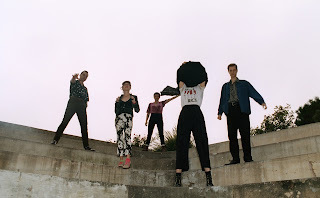 To steal from the band's press release, it is a mixture of "... post punk, contemporary pop, hip-hop, kraut rock, and folk-derived narrative songwriting." That sounds like a total mess of genres that would just be a trainwreck, but the song works perfectly. It's far more fun than art rock has any right being. You can watch the 360-degree interactive video for "How Did This Happen!?" below. BODEGA's debut album will be out this summer on What's Your Rupture? For more on BODEGA, check out their website. Their current tour dates are below the video. Labels: bodega, how did this happen! ?, Ken Sears, what's your rupture?